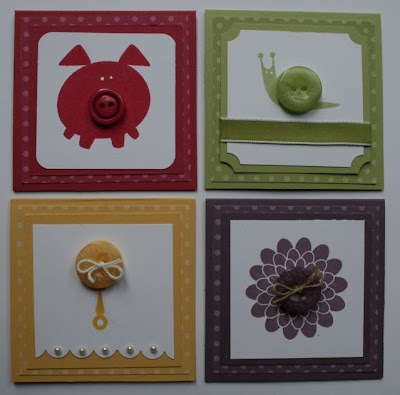 Craftin' Caro: Team member share: Button Buddies! Team member share: Button Buddies! I'm so excited to share with you some absolutely adorable 3x3" cards made by Jennifer Mallette, one of our "Canadians, INK!" team peeps. She used the Subtles collection of colours (specifically, Certainly Celery, Rose Red, Perfect Plum, So Saffron) to keep everything in the set cohesive. The nice thing with Stampin' Up! of course will be the ease in matching colours, since everything is coordinated! So she just needed to pull out her Subtles package of buttons to play with = easy as that. If you don't recognize the stamp set, it's a new one called "Button Buddies"...how adorable is that? The images in the Button Buddies set pair well with the Designer Buttons to give all your projects a one-of-a-kind style. Whether it’s a pink nose on a pink pig, or an orange shell of a slow moving snail, adding a button will add dimension to whatever you are working with! "I got hooked on SU at a Dina Anker demo (with my partner in crime Grace Lin!) last fall and have been having a great time learning all kinds of techniques and ideas from my extended SU Canadians INK! family since then...looking forward to taking it to the next level in a business sense in the coming months!"